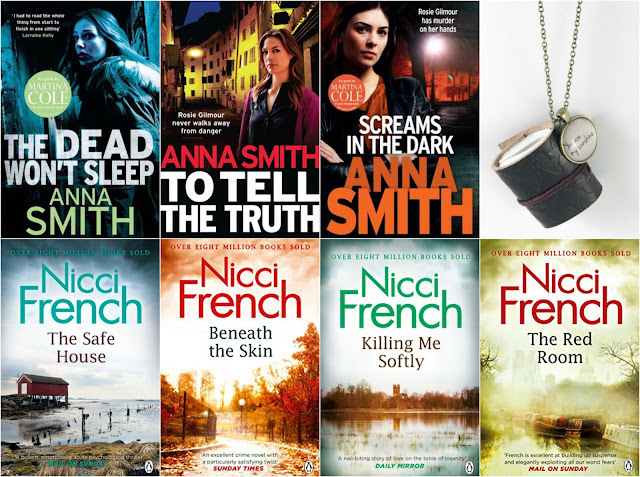 Enter this giveaway for a chance to win books by Anna Smith and Nicci French and a leather journal and quote necklace. Good luck! I like that sense of dread about what's going to happen. LOL I've always loved creepy stories and movies. It tickles certain fight or flight responses that are entertaining, the release of tension, over and over until a hopefully cathartic ending. So, just for a short span of time, I am willing to endure the terror in order to enjoy a euphoric sense of relief at the end. I seem to enjoy the adrenaline rush of being scared while being safe. I love the suspense and the cinema in my head - while I know I'm safe, it's still like being in the middle of the action. I love that they keep me in suspense and make me want to keep reading. love their power to make me jump, and to make me wonder what's gonna happen - there's a certain enjoyment in fear and suspense! You never know what's going to happen and the fear of what might or might not happen is the big draw for me. Love creepy stalker stories where it's not SO MUCH the violence, but the little things that happen along the way, as in things being moved round the house or people that appear everywhere you go. Quite funny when I had a stalker of my own (my x-bf followed me about and stood outside our house for 3 weeks). Still love the creepy stories though. Creepy stories keep me gripped and intrigued. I like feeling the story as I am living it. I enjoy suspense very much! It's hard to put that kind of book down because I can't wait to find out how it is going to end. Thank you for the giveaway! I have always loved creepy stories and I really don't know why! I read so many V.C. Andrews novels in my teen years! Creepy stories are intriguing and keep you on the edge of your seat, wondering what's going to happen next. I love books with twists and suspense, anything that keeps you guessing or even a scare. These books pull you into their world and get your heart racing. I have loved creepy stories since watching It's Alive. I find them thrilling and I like how they take my mind away from the everyday happenings. I like the sense of suspense and how the stories grip you with thrilling twists. How utterly believable some of them are !! I love a good creepy story to keep the kids in line at night. We can read them aloud and scare the living daylights out of them. I love that feeling of needing to bite my nails, of being totally mind blown. It's the unknown that scares me & creepy stories have that. Creepy stories are usually those I cannot put down, so I like them for that reason. I love that neck-prickling feel you get under the covers when a book truly scares you.